Liam Hemsworth Net Worth and Salary: Liam Hemsworth is an Australian actor who has a net worth of $26 million. Liam Hemsworth was born January 13, 1990 in Melbourne, Australia. He first became famous for his role as Josh Taylor in the soap opera Neighbours and as Marcus on the children's television series The Elephant Princess. In 2010, he starred in the American film The Last Song. In 2012, he starred as Gale Hawthorne in the first of The Hunger Games film series, based on an adaptation of Suzanne Collins' best-selling novel series. Hemsworth's older brothers, Luke and Chris, are also actors. Hemsworth has said that though there is competition for jobs among the three brothers, it is friendly. 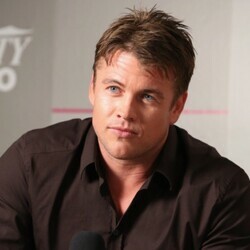 When Hemsworth was 8 years old, he moved with his family to Phillip Island, a small island where he spent much of his time surfing with his brothers. In March 2009, he moved to the United States to pursue a career in acting. He and his brother Chris first stayed in the guest house of Chris' manager, William Ward, before renting their own Los Angeles apartment. While Hemsworth has certainly carved out a name and reputation for himself, he is perhaps most widely known for his relationship with Miley Cyrus. After three years of having an on-again, off-again relationship, the couple announced their engagement in June 2012. They lived together in Los Angeles but ended their relationship in September 2013. In July of 2014, Hemsworth noted that he and Cyrus would "always be best friends" and that they had "an instantaneous and powerful connection". They actually continued dating and in December 2018 reportedly got married. Liam's brother is Thor actor Chris Hemsworth.